Ever thought of showing your Vizsla? Dog showing is rewarding, confidence building and great day out for you, your dog and the whole family. Showing will give you a better understanding of your dog and enable you to become more knowledgeable about other breeds as well. If you are new to this sport, go along to some shows, spend the day there, talk to exhibitors and breeders to see what is involved and how it all works. Your breeder should also be able to give you some assistance on how to get started in showing. Like other dog activities, some basic training is involved initially. Your dog should be able to stand still and gait on a lead. To find out when and where shows are on look in your state governing body’s gazette, which you should receive once you have your puppy registered in your name. They will also have information on show handling classes. 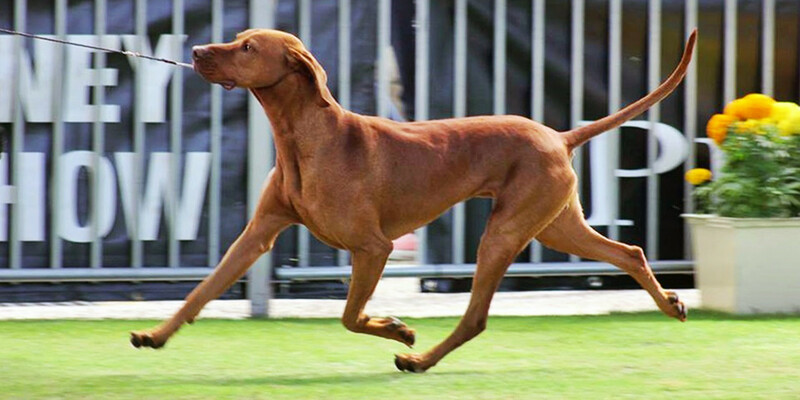 To enter a dog show, your Vizsla must be registered on the “Main Register”. If you need help in entering your first show, contact the Club, your breeder or your state canine council. Special entry forms are required. Dog shows offer a range of classes in which to show your dog – most are age based and your puppy must be 12 weeks old before being able to be exhibited. Titles currently available are Champion (Ch) / Grand Champion (Gr Ch) and Supreme Champion (Sup Ch).